A religious scholar of Shia school of thought named Allama Imdad Hussan Jafri was slaughtered, on Wednesday. 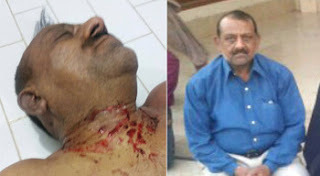 According to the details, tortured body of a man resident of Latifabad # 9 Sadaat colony was found killed by unknown motorcyclist outside his door. The armed terrorists entered in the house of martyr Imdad Jafri in and slaughtered him. As per details deceased person’s name was Imdad Husain Jafri, Secretary Welfare of Majlis-e-Wahdat-e-Muslmeen (MWM), he was rushed to hospital but succumb to death. Police handed over dead body to the family. whereas resident of Latifabad was chanting slogans against administration and poor law and order situation in the city. The police has started the initial inquiry, however, it was not clear that whether this was a sectarian killing or there was any other motive.